Rare took inspiration from our 'good PC port' guide. A few years ago, we published an article asking developers to stop making horrible PC ports. It's a guide that should have been inscribed on massive stone tablets throughout the land, but it's 2018 now, and rubbish PC ports are still happening. 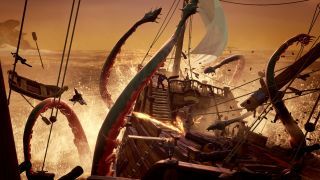 One developer our words did get through to is Rare, who took to the stage at the recently concluded PC Gamer Weekender to reveal just how close Sea of Thieves comes to following our extensive list of commandments to the letter. Sea of Thieves will be with us on March 20th, so mighty soon. You might want to take a look at those surprisingly achievable system requirements while you wait.